Mike is a former ITV cameraman and interviewer with almost 30 years experience in electronic news gathering. 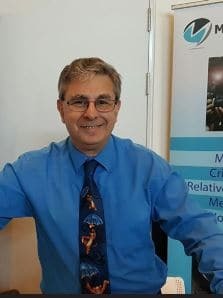 Mike first started media training back in 1992 and has developed a course that has been delivered throughout the Asia Pacific region, Europe, West Africa, the Middle East and Russia. Mike's main area of expertise is within the oil and gas sector but our courses have been delivered to companies involved with shipping, aviation, transportation, education and finance. Mike has worked in radio as a presenter for many years and has presented daytime radio shows throughout the UK and more recently in Brisbane. where he has recently been nominated for the role of senior vice president at 101FM, one of the largest community radio stations in Queensland. As a highly experienced interviewer Mike has trained all levels from CEO, senior spokesperson, MD, terminal manager through to reception, security, front of house and facilities. Many companies forget that the first point of contact with media is often with security should a major incident occur outside normal working hours. In the case of untrained staff, a stray comment can have long lasting impact on the reputation of that company. Our courses look at the worst case scenario and potential reputation damage. We also have vast experience as 24-hour media responders providing full emergency response cover to clients in Aberdeen (UK). We are not a 'good news' PR company and focus on crisis management and preparation for a major incident as opposed to media spin. We leave that to the politicians! $6,500 + GST per full day for up to 6 participants. "After 30 years in the media, I have worked with many in the media training game and Mike is the best. I am truly impressed with his insights and razor sharp knowledge of how the media works and how to work the media. To really learn how to manage and protect your brand, you have to get in front of a seasoned professional – and that is Mike". "Mike is an experienced media training practitioner and an engaging presenter who always finds entertaining and relevant ways to educate and inform his audiences. Mike ran a media training skills session for IABC while I was president of the chapter, and we received great feedback for the session. He has decades of experience in how the media works, and makes a point of keeping on top of current trends so that his workshops are able to provide up to the minute best practice". "Mike Bennett and Media Answers provided excellent support and training to Falkland Oil & Gas for its drilling campaign off the Falkland Islands. This covered media response in emergency response exercises and on-call media response services in the event of an incident during operations. Personal training was given on media response aspects to emergency responders. Mike's approach is very focussed to his individual client's needs, and his advice was very valuable to preparations. He/Media Answers were integral members of our ER team". "Having worked with Mike over the past 5 years I would say that Mike presents â€œup to dateâ€ and relevant training on how to deal with the Media during a Contingency Situation. The training given is delivered in a professional and calming manner that provides the attendees with the required tools to deal with enquiries from the media. The related subject matter provided by Mike during his training is always of the highest standard".